As much as I like a good woodworking book that gives me instructions and dimensions I can use as a basis for a project, I have just as big an affinity for books that make me think about what I’m creating before I even make my first saw cut. These are the kinds of books that also help me to stop worrying about being so exact with my measurements and dimensions and just let the form evolve and grow as I build it. This is the spirit I want to nurture in my own artistic style of woodworking. Our attempts mostly in the line of domestic architecture may be arranged in three grand divisions: 1) to understand as many phases of human life as possible; 2) to provide for its individual requirement in the most practical and useful way; 3) to make these necessary and useful things pleasurable. The first chapter discusses plans, beginning with the request for a simple bungalow from Mr. & Mrs. Arturo Bandini in 1903. This U-shaped design was one of their first that encouraged a flowing relationship between inside and outside spaces. In the houses that follow, Makinson and Heinz show you another 13 or so plans, stepping through the evolution of the overall idea of building a structure that is harmonious with its surroundings. In the second chapter, the focus turns to the materials they used, from shingles and siding to natural stone and brick garden walls. Through their distinctive and creative use of natural materials in their design elements, they fashioned graceful and inviting houses that did not rely upon grandiose budgets. The chapter most woodworkers are going to jump to is the third one, which focuses on interior rooms they designed in their entirety, from the hardwood flooring laid on a bias to the candlestick sitting on the fireplace mantle. This chapter contains photographs of rooms staged as they would have appeared when the home owners saw them for the first time. Though they depict different rooms, in different houses, during different stages of their architecture career, they always display what Charles Greene referred to as “the oneness of all that exists.” If you take your time, and really examine at the details in the imagery, you can easily find the small things that build on and complement each other to create continuity and harmony within each space. If you are looking for a book with a bunch of pictures of the typical Greene & Greene elemental styles we see every time Charles or Henry Greene’s name is mentioned, then this may not be the right book for you. But, if you are interested in reading about their first architectural projects and seeing how these projects planted seeds that grew into what we now expect to see, and if you are interested in trying to apply Charles Greene’s third grand division of architectural belief to your own work, to make necessary and useful things that are also a pleasure to touch and use and see, then… maybe this is a book you should consider reading. I love the Greene and Greene style though it’s probably a little beyond my skills at the time to do it justice in a build attempt. Either way this was a great review and I’m going to have to check it out. Thanks. Ah, thanks, Bill! I think they’re getting better (the reviews, that is) each time I do a new one. For the record, I DON’T think this style is beyond you. Start small. Make a box and do a little cloud lift detail in the edge of the lid or made a small side table and add the cloud lift to the bottom of the four sides. Or, better yet, just add a bit of free-form inlay to enhance the existing figure in a board you’re using in a project. Blend in your added details so they look like a natural extension of the piece. It doesn’t have to be all “This is a Greene & Greene Side Board With 24 Cloud Lifts And 52 Pillowed Ebony Plugs” for you to borrow from the concepts of their work. That’s exactly what I did with that last box I blogged about, by the way. I wanted something that was along the same lines of Greene & Greene, but not “blingy”. So I made the box with the proud box joints using mahogany, and that was it, as far as borrowing from their style. Next time, I’ll try something different. 🙂 That’s the fun part! Funny, I remove my dust jackets as well. I have a plan for a Greene and Greene style hall table that I’m always thinking about attempting. I’m going to have to give this book a try first and see if something catches my eye. Thanks again for the good review. That’s a well written review. 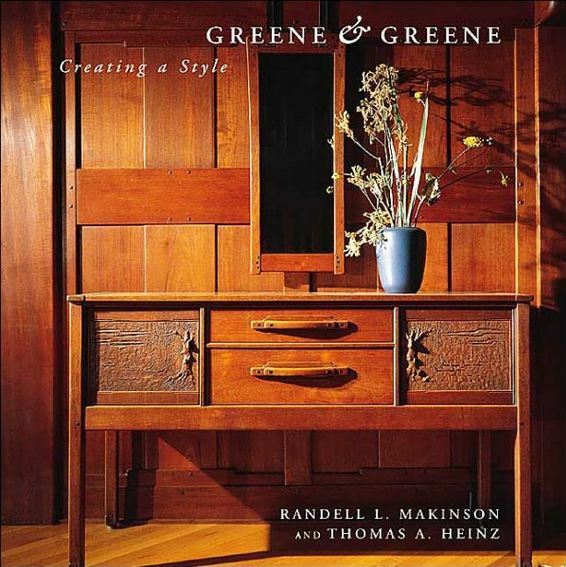 It makes me want to check out the book..It sounds particularly interesting because of your use of the framing device of their design philosophy, because my goal hasn’t been to make Greene and Greene furniture, but to figure out my own design language. Since as you describe it, this book is about the evolution of one of the most recognized design aesthetics of the 20th century, it would seem to be a valuable work for me to study. Thanks. Thanks, Jay! I’ve really been working on my reviews. Glad you liked it! I have two primary sections in my woodworking library. Well, three. One is for magazines. One is for woodworking techniques and tool studies and equipment maintenance. And the last one is for spiritual woodworking. That last section is, by far, my favorite. That is where I keep my Krenov and my Nakashima and all the books I read when I want to get inspired to build something, not look at a plan to build something. I read those books WAY more often than the others, because once I figure out a technique, then I generally don’t have to go back and read up on it, right? But I always find something new in the books that help to guide HOW I approach my woodworking and how to come up with, as you put it, my own style.